Delivered to over 1300 distribuion locations. Directly mailed to professional offices (Doctors, Lawyers, Dentists, Accountants). Placed on BC Ferries (Nanaimo, Victoria, Sunshine Coast). Outdoor box locations from Abbotsford to Whistler. 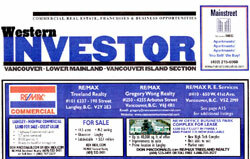 All listings syndicated to 12+ online partners including GlobeandMail.com, ZooCasa.ca, dupontregistry.com, New York Times, Greater Homes and Destinations, Wall Street Journal (Europe China Asia IndiaLatin America), Robb Report, New York Times Mansion Global + Chinese and Spanish Versions, among others. The Ming Pao Group in June 1993 set up Ming Pao Western Edition in Vancouver. Ming Pao Westren Canada Edition has become the largest readership of local Chinese newspapers. Widely respected as an important voice, Ming Pao is recognized as one of the most influential papers for Chinese professionals and business leaders throughout Western Canada. Ming Pao Daily News has?277,500 Weekly Readership. Les Twarog advertises your properties in this publication to reach?the Chinese purchasers. The home network formally launched the outside website in November 2011. It is tailor-made for domestic Chinese buyers demanding a global international real estate professional Chinese internet search engine and information platform. Our Chinese Marketing Partner. Juwai.com provides innovative ways for us to reach new audiences and develop new opportunities. Juwai overcomes the barriers of language, distance, and culture - providing us instant access to Juwai's exclusive audience of high-net-worth Chinese buyers. Juwai has XML feeds to companies in New Zealand, Australia, Europe, UK, USA and Canada. As the #1 Chinese international property portal, Juwai.com - with 2.6 million Chinese consumer visits each month - puts us in front of Juwai's exclusive audience of high-net-worth Chinese looking to invest overseas. This audience has the means and desire to invest on international property. Google Not Available In China. Shaughnessy is Vancouver's best example of a planned community. In 1907, the CPR spent more than one million dollars developing the site before it began selling the high-priced lots. The estate-like character of the community is a result of a combination of large lots, winding boulevards, and extensive landscaping. Today the area is one of the city's most valuable heritage landscapes. www.shaughnessproperties.com is a comprehensive website detailing the history of the area as well as local attractions, businesses and entertainment. Sonja delivers the latest flyer highlighting her properties for sale on a monthly basis. RE/MAX of Western Canada has a proud history of providing first class service & expertise to clients from Manitoba to Vancouver Island and everywhere in-between. This year we are pleased to launch LOCATION Magazine, an inspiring portfolio containing listings throughout Western Canada paired with engaging content in interior design, architecture, food, and profiles on the communities we serve. The quality of this product seamlessly aligns with the distinction of RE/MAX REALTORS and the service we provide our respective clients. 20,000 copies per issue will be delivered to consumers and professional centres all across Western Canada as well as placement on BC Ferries. Locations include Winnipeg, Brandon, Regina, Saskatoon, Swift Current, Prince Albert, Fort McMurray, Edmonton, Calgary, Red Deer, Medicine Hat, Lethbridge, Cranbrook, Kelowna, Kamloops, Penticton, Prince George, Fort St. John, Vancouver, Victoria, Duncan, Nanaimo, and the Comox Valley. Westca.com provides powerful business website system (RealtorSun System) for Real Estate Industry. It offers a one-stop web solutions including domain name registry, website hosting, website construction, Content Manage System and a series of useful functions. 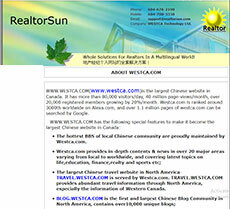 www.westca.com is the largest Chinese website in Canada. It has more than 80,000 visitors/day, 40 million page-views/month, over 20,000 registered members growing by 20%/month. Westca.com is ranked around 3000th worldwide on Alexa.com, and over 1.1 million pages of westca.com can be searched by Google. 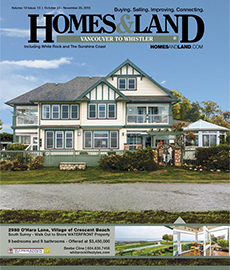 Featured properties are advertised in the PostMedia Network Paper, The Vancouver Sun. The Vancouver Sun - Since 1912, The Vancouver Sun has cast a watchful eye on the events, issues and politics of the day ? all with a unique West Coast perspective. Publishing Monday through Saturday in print and daily online at vancouversun.com, we are proud to be B.C. ?s largest newsroom and are dedicated to telling the stories of our vibrant community. As a Global Marketing Agent (Formerly International Real Estate Specialist - I.R.E.S. ), Les Twarog can show you how to market your property differently than any other real estate agent. you've heard listing presentations and what options REALTORS can offer you for marketing your property. These are only the basic sercies such as MLS, Realtor.com, open houses, etc.. In addition to those services, Les can explain to you how his services are different from others. have you ever thought about promoting your property in other areas to bring buyers from out of province or from another country? A monthly news letter from the Les Twarog & Sonja Pedersen team goes out to 3000 people monthly. The news letter covers topics like friendship, integrity, real estate news, the real estate market, tips on buying and selling and upcoming events. Each month Les has his feature listings posted and insights into special buying and selling problems. Facebook is a social networking website launched on February 4, 2004. Users can join networks organized by city, workplace, school, and region to connect and interact with other people. The website currently has more than 1.23 million active users worldwide. Facebook users can choose to join one or more networks, organized by city, workplace, school, and region. These networks help users connect with members of the same network. The website is free to users & they can create profiles including photos and lists of personal interests, exchange private or public messages, and join groups of friends. Craigslist is a central network of online communities, featuring free Online classified advertisements - with jobs, internships & housing. Craigslist has established itself in approximately 450 cities in 50 countries. The site serves over nine billion page views per month, putting it in 47th place overall among web sites worldwide, ninth place overall among web sites in the United States. With over thirty million new classified advertisements each month, Craigslist is the leading classifieds service in any medium. The site receives over two million new job listings each month, making it one of the top job boards in the world. The classified advertisements range from traditional buy/sell ads and community announcements, to personal ads and even real estate. All our listings are loaded on this medium. By doing so it pushes up our rankings on website search engines, and in most cases our listings will appear on the 1st page. Kijiji is Canada's most popular free, local classifieds site. Kijiji offers a convenient, fun, and easy way for people in the same city to buy, sell, trade and help each other out in areas such as goods, cars, services, housing and jobs. The word "kijiji" (pronounced like key-gee-gee) means "village" in Swahili. This name was chosen because it captures the essence of what we are creating - a site where people can connect with others in their community. Kijiji sites are currently available in dozens of cities around the world. Kijiji was launched in Montreal and Quebec City in February 2005. In November 2005, Kijiji expanded across rest of Canada and is now in over 100 cities coast to coast. Founded in February 2005, YouTube is the leader in online video, and the premier destination to watch and share original videos worldwide through a Web experience. Most listings that have videos are also posted on YouTube - by doing this - we push up the ranking of our listings on the internet. Most times our YouTube listings show up on the 1st page of a Google search. Western Investor has a circulation of 17,500 magazines a month. 5,000 of those are subscriptions and 12,000 copies in newsstands. Les advertises all his commercial ads in this publication. It is published once a month and is distributed throughout BC and Alberta. You can pick up a copy at most major newsstands, supermarkets and malls. Western Investor is the trusted source for commercial real estate, franchising and business opportunities in Western Canada. Industry professionals and private investors from across BC, Alberta, Saskatchewan and Manitoba have been relying on Western Investor for all the latest news and the most comprehensive listings for over 30 years. Pixilink Solutions is an elite team of professional photographers and Internet specialists that combine vision and experience to produce innovative solutions for today's business problems. Founded in 2003 by Varinder Kainth, Pixilink Solutions has quickly grown from a provider of virtual tour services into Canada's only truly inclusive, one-stop marketing shop for agents. To View The List Of "Internet marketing samples for Sellers" Go To "Click For Current Edition" or "Click For Archive"
This free app has property search, property listings, mortgage calculator, and allows you direct contact with your local agent: Les Twarog. call - 604-767-17000. 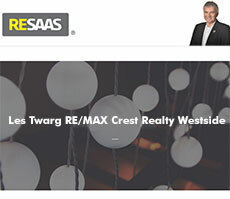 RESAAS Services is bringing change to the real estate industry with cloud-based platform. RESAAS (for ?Real Estate Software as a Service?) is kind of like Facebook and LinkedIn for real estate agents combined. It captures all of the communication features of a social media platform and empowers real estate agents with the depth of data typical of the Multiple Listing Service, that enables agents to knowledgeably present and sell listings of other agents. It?s a cloud-based social business platform specifically designed and configured for the real estate services industry. By creating a social platform that integrates with Facebook and other existing networks, agents are able to exploit and extend their personal and professional associations, thereby creating a deeper client pool and adding value to the utility of the service for the agent. Members log in and see a stream of posts from fellow area real estate agents highlighting the most recently listed properties. Like a Bloomberg terminal - where everything in the stock market is in one place in real time - RESAAS unites Agents, Brokers, Franchises and MLSs in a single place. 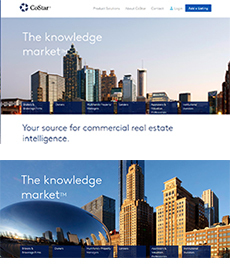 CoStar creates opportunity in the commercial real estate industry through a combination of reliable tools, resources, and deep understanding on over 5 million commercial real estate properties. The Certified Luxury Home Marketing Specialist? (CLHMS) designation assures affluent buyers and sellers that real estate professionals have the knowledge, experience, and unique skills to meet their needs. Members of The Institute who hold the CLHMS designation have documented performance in the TOP 10% of their residential markets and have successfully demonstrated their expertise in the luxury home and estate market.